White Wolf : Pumpkin Party: What does a Wolf do with a Pumpkin? Pumpkin Party: What does a Wolf do with a Pumpkin? 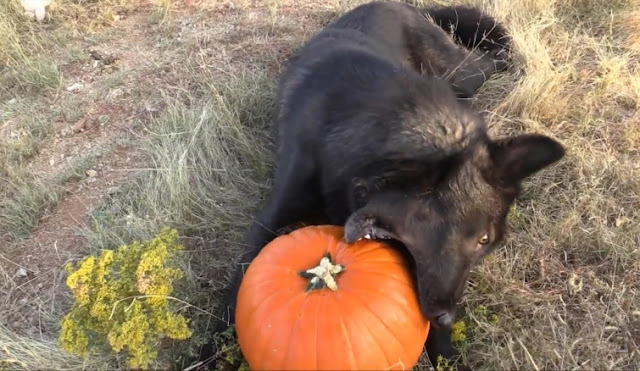 This playful wolf received his first pumpkin. Okay, so he didn't know quite what to do with it, but after a little bit of rolling it around, he figured out just how to bite into a pumpkin! In the United States, pumpkins go hand in hand with the fall holidays of Halloween. An orange fruit harvested in October, this nutritious and versatile plant features flowers, seeds and flesh that are edible and rich in vitamins. Pumpkin is used to make soups, desserts and breads, and many Americans include pumpkin pie in their meals. Carving pumpkins into jack-o’-lanterns is a popular Halloween tradition that originated hundreds of years ago in Ireland. Back then, however, jack-o’-lanterns were made out of turnips or potatoes; it wasn’t until Irish immigrants arrived in America and discovered the pumpkin that a new Halloween ritual was born. The largest pumpkin pie ever baked was in 2005 and weighed 2,020 pounds. Pumpkins have been grown in North America for five thousand years. They are indigenous to the western hemisphere. Native Americans flattened strips of pumpkins, dried them and made mats. Native Americans called pumpkins "isqoutm squash." Native Americans used pumpkin seeds for food and medicine. Responses to "Pumpkin Party: What does a Wolf do with a Pumpkin?"